A compact travel guide for New Delhi that is composed of the recommendations for the attractions of the city, restaurants and accommodation options. New Delhi is vivacious, glorious as well as an important financial hub of India. It presents an example of pride of the country and has been the seat of power over centuries. New Delhi is popularly known as “Dilwalon ki Dilli” meaning that the city belongs to large-hearted. 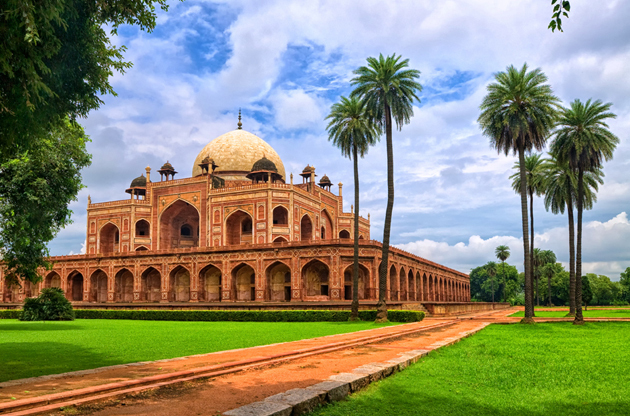 The people of New Delhi have thoughtfully built up a rich multi-ethnic and multi-cultural heritage over generations with the influence of Mughal and British rulers. They have a huge diversity comprising of fine artwork, western and classical dance and music, diversity in festivals (Holi, Diwali, Dusshehra, Basant Panchami, Mango Festival, Christmas, Maha Shivratri, and Independence Day amongst many more). There is no particular ethnicity followed in Delhi as the city is formed by blended influence of all states where in on one hand you will find people wearing sari and kurta- pajamas & on the other hand people wearing modern clothes. The best time to visit Delhi is between the months of October to March. Delhi experiences a very erratic climatic behavior where in summers (April to August) temperatures can be as intolerable as 45?C and extremely cold and windy winters (November to February) where temperatures can be as low as 2?C. New Delhi is a planned city made by British in the year 1911. Much of the monuments and old historical attractions are a part of Old Delhi which was the capital of Islamic India whereas modern shops, eating joints, and hotels etc… serves as a part of New Delhi. Visit to the city is incomplete without having a view of major attractions such as – Lotus temple, Akshardham Temple, Qutub Minar, Humayun’s tomb, Jama Maskid, Red Fort, Old Fort, Rajpath, India Gate, AutoExpo and BookFare at Pragati Maidan, Surajkund Mela. The city is spread across river Yamuna located on the Indo-Gangetic Plain. The National Capital Territory (NCT) is bridged into New and the Old City. Faridabad, Noida, Gurgaon and other nearby small towns forming united states. New Delhi is connected to Uttar Pradesh in the East, Haryana in the North and Rajasthan in the West. Indira Gandhi International Airport is the biggest airport in the country. The airport has 3 terminals and carries both international and domestic passengers. The newly constructed Terminal 3 is one of Asia’s most lavish airport destinations which have a total capacity of 10.5 million passengers per year. After the flight, prepaid-private taxis can be hired which will take you to your destination in a very safe and sound manner as they are tracked through GPS systems. You can even take Airport Express Metro that connects all major destinations through New Delhi Metro Station (on Yellow Line Metro). However, rush hours in metro (9:00 AM to 11:00 AM and 5:00 PM to 7:00 PM) may be avoided, as the crowd is on its peak during these hours. The ultimate temple in India which reflects Indian culture and spirituality. The attractions inside are – Theatre, Musical Fountain, Hall of Values and the spectacular boat ride reflecting 10,000 years of Indian history. Auto expo is Asia’s largest automotive show. The show is witnessed in the month of January and all latest automotive designs are uncovered at Pragati Maidan. Every year during November- December World Book Fair is held in Pragati Maidan and it is India’s oldest and largest book Fair. The museum has a huge collection of artwork both inspired from Indian and foreign origin. History is alive under this roof. This is practically a garden spread over rocks and its beauty is just a true imitation of nature at its best. The park was constructed with the vision that this place would provide leisure space for people. The park is surrounded by many food stations and liquor serving bars. For electronic gadgets and items, the best place would be Nehru Place which is the Computer hub of India. Select City Walk, Saket is one of Asia’s biggest malls and here almost everything in the world may be found under one roof. Another traditional shopping attraction is “Delhi Haat” (at INA), where goods (traditional clothes, art pieces, jewelries and cutleries) can be shopped for. The unique concept of this place is that traditional art and craft works from all states of the country are sold in an open environment and they can be taken as a token of remembrance for your visit to this country. Most professional restaurant in the city. Has a serene and peaceful ambiance. The place is famous for all type of cuisines and serves liquor too. Eat until you can stop. This restaurant is buffet-type and you can relish the taste of North Indian food, Chinese, Mediterranean and Mexican food. Famous for American, Mediterranean, Mexican and North Indian Food, pub. Places to spend extra saucy nights are Shalom Med Lounge Bar, @Live, Q’BA, Regent’s Blues and Ego Lounge. Nightlife of the city in pubs and bars are very loud and thrilling. However, one should be aware and attentive after stepping out from pubs and bars and should travel in their personal vehicles. The streets of Delhi are deserted after 11 PM. For sight-seeing around the city you can take a ride in Hoho bus which is a pre-itinerary Delhi tour ride touching main attractions of Delhi like Lotus Temple, Humayun’s tomb, Qutub Minar, Purana Qila, Red Fort, Jama Masjid and many more. Hill stations near Delhi (may not be more than 5 hour long drive) are – Bhimtal, Chamba, Barog, Sattal, Kasauli, Musoorie and Nainital. Chariasmatic picnic and one-night spots around Delhi include (0 to 200km) – Agra, Damdama Lake, Behror, Bharatpur and Manesar. You would require a cab to be booked to visit these places (like Easycabs, Merucabs, Megacabs). Being both the modern and historic face of India, New Delhi is a perfect hub for international gatherings like conferences, fairs, exhibitions, symposiums and congresses. Having world class venues and fully equipped facilities, leading global events can be hold in New Delhi each year and draws international attention to the city. Especially in the recent years, New Delhi has become one of the most preferable destinations for the international events and it is growing more and more as a meeting city.